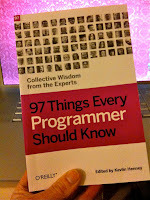 The latest book in O'Reilly's 97 Things series is out now: 97 Things Every Programmer should know. I have three items in this book, and have just received my paper copy (photographic proof attached for the non-believers!). Despite the somewhat underwhelming cover (it's now the series ident, apparently), it's actually a very well produced book. Thanks to everyone involved. Details from the publisher's website here. Chapter 26 Don't Ignore That Error!